Family members of several victims of the Virginia Tech shootings on Wednesday pleaded with a panel investigating the killings to assign accountability for the tragedy. "We expect this panel to come up with responsibility and accountability for the actions on April 16th and before," said Dennis Bluhm, whose son Brian was killed by gunman Seung-Hui Cho. "We are concerned that your panel will come up with some well-thought-out recommendations for the future, but not the reasons behind April 16th and the mistakes made over the years." Meanwhile, the lawyer advising Virginia Tech on how to distribute more than $7 million in donations has proposed a tentative payout plan. Kenneth Feinberg's proposal calls for victims' claims to be filed by Sept. 15 and the money distributed by Oct. 31. Under the proposal, families of the 32 people who died could each receive a $150,000 payment, or take part of that in cash and have the rest set up as a scholarship in the victim's name. Those who were hospitalized for 15 days or more would be offered a $75,000 payment, with the option of a one-year scholarship at the school and the rest in cash. Those hospitalized for a shorter period could receive $25,000, or a one-year scholarship and the rest in cash. Those with less serious injuries could receive $8,000 cash or a year's tuition. Feinberg said he would continue to meet with families until Aug. 1, and draw up a final plan after that. The families spoke out Wednesday during the final public meeting of a governor's panel assigned to review the shootings. The eight-member panel is expected to issue a report with wide-ranging recommendations next month. 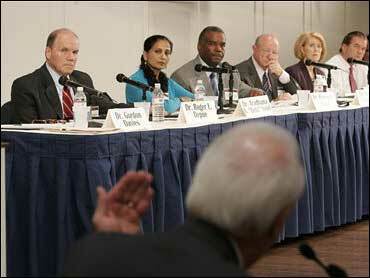 Panel chairman Gerald Massengill offered assurances that the final report will be hard-hitting. But some of the victims' relatives said they were worried the panel would not blame anyone for the massacre. "When there's 32 dead, one suicide, 25 or 26 injured and many dozens or hundreds traumatized, I think that presents a situation where pointing of fingers is necessary," said Roger O'Dell, whose son Derek survived despite being shot. "What has happened necessitates pointing fingers and taking heat." Through tears, Cathy Read, whose daughter Mary Karen Read was killed, asked the panel to make recommendations in its report on patient privacy laws, mental health care, gun availability and the safety of students at universities. "I worry that the review panel will take a narrow view of the events related to April 16th and miss the broader opportunity to make something good come out of the evil of that day," Read said. "So I ask you, take the road less traveled and decide to address the hard issues." The panel's staff director, Phil Schaenman, outlined what the report will include: a detailed timeline of events, university security issues, Cho's mental health history, counseling treatment and legal issues, gun access and gun purchase laws, and the police and university's actions related to both sets of shootings on April 16. The report also will include a section on the aftermath of the tragedy and how the university and state reacted. Some victims' family members touched on specific issues they want the panel to address, such as why Virginia Tech did not issue a lockdown after the first set of shootings, or immediately alert the campus. "Imposing something might have been better than doing nothing," victim's mother Holly Sherman told CBS19 News correspondent Lisa Ferrari in Charlottesville. "I think notification of the first shooting should have been made immediately. I don't care how. Maybe a loud siren." Families of 16 deceased victims and two of the injured asked in a statement released Wednesday night that a federal commission also be appointed to investigate the shootings. "We expect for the panel to identify in their report those issues which are beyond their scope and to address our call for a federal commission to continue the work of the panel and address the broader issues for the nation," the statement read. Don Challis, president of the Virginia Association of Campus Law Enforcement Administrators and police chief of the College of William and Mary, told the panel that lockdowns of college campuses during emergencies are difficult to execute and are not appropriate in most cases. Challis said the size and layout of most college campuses make lockdowns an unrealistic option. Instead, Challis said universities should advise faculty, staff and students to find a secure location such as their room or office during an emergency. After the meeting, Massengill reiterated that the panel was still exploring all angles of the investigation and would issue a comprehensive report. "As to whether we will answer all the questions or say all the things that some people want us to say, I doubt that," he said. "I expect in the eyes of some people the recommendations will not go far enough. I expect in the eyes of some other people they'll go too far."